Updated Group Sense Limited has revealed more information and specs on two new upcoming Palm OS Smartphones. Both run Palm OS 4.1 and feature very small and lightweight designs. The phones will be targeted at the Asian and European markets. Both models share nearly identical internal specs and capabilities and differ only by form factor. The Zircon is a flat, candy bar style phone model while the Oynx has a clamshell/flip design. They run Palm OS 4.1 with a 33mhz Dragonball processor and use a 2.2” inch D-TFD color screen with a 160 x 240 screen resolution. Both utilize a virtual graffiti area for data input. Both phones include 16MB of RAM, but lack memory expansion slots. The Smartphones use a class 10 GSM/GPRS 900/1800 dual band radio and are powered by a 900 mAh removable Lithium Polymer battery. GS rates the battery life at 100 hours standby with 2 hours of talk time. The phones also feature an IrDA port, polyphonic ringtones and vibration alert. They will also include applications to access WAP, Email, SMS/EMS/MMS and J2ME data services. The Zircon’s dimensions are 100 x 48 x 21.1 mm (3.9 x 1.9 x 0.8 inches) and it weighs approximately 139 grams (4.6 ounces). Each model also has an integrated digital camera which can capture small pictures at up to 352 x 288 pixels. Pictures can be sent from the device with MMS. The hardware buttons include a 5-way navigation pad, talk and End buttons and two application buttons for messaging and the camera application. The models may be available in parts of Asia as early as May and are expected in Europe sometime in the third quarter. There is no information on pricing or carrier availability. The devices will not likely see a North American release because they lack a tri-band cellular radio. Most North American GSM carriers operate at the 1900mhz band, which these models do not support. 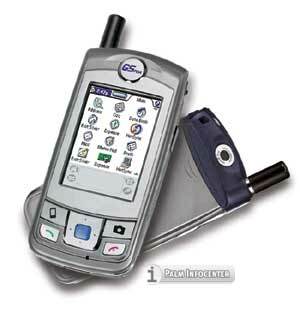 Back in December, Group Sense PDA Limited became a licensee of the Palm OS. Under the terms of that agreement, GSpda announced it will develop and market mobile devices based on the Palm OS for the Asia Pacific region, including China, Taiwan, Hong Kong, South Korea, Thailand and Singapore. Thanks to PDAFrance for the images. 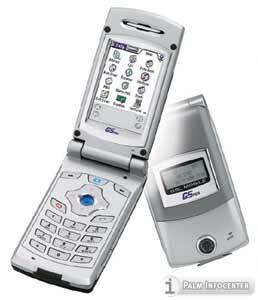 If you go to GroupSense's website, you will also found another Palm OS Phone with clamshell design. It's called Onyx! WHOA!! That Onynx looks cool, even better than the SPH-i500! A numeric keypad plus VG is an interesting combo that no other Palmos smartphone has right now! Nice! OK, great thanks for the link, I will update the article. I very much like the virtual graffiti, but the Samsung SGH-i500 will have 320x320, 32 MB RAM, OS5.2, 300 MHz, a memory expansion slot, and an extended life battery available. I don't know, I think this is very smart marketing move. I think there is a fundamental market for smartphones lost because of their, thus far, relatively large size. I know I would get one if they were the size of the current smaller phones. I have a Clie, but would still carry a small smartphone because it's not possible to always have the clie with me but I can always find space for a small cell. And I think many consumers who are interested in the more basic functions of a PDA will be more interested in these smartphones if they're smaller. That beings said, I really think hi-res is a vitally important feature when you shrink the screen this much; not having this may turn out to be a fatal flaw. On the other hand, folks are snatching up the current crop of color cell phones, and their screens are middling at best. Bluetooth and A-GPS to start. doesn't it a perfect specification/functionality of a mobile phone you're dreaming of? "- a built-in camera (that means caller-id with photo)"
you need a cam for that? "you're comparing a Benz with a Toyota"
How much smaller are the Toyota models than the Samsung? I have never been a fan of all-in-one devices but this has me thinking that having my pda info on my phone as well as on my real pda would be just fine. I would need to be able to sync them together so that I could modify a database on the phone and have that synced to my pda too.. This has possibilities. And to think that it is not a brick or ugly as a Treo!!!! Do you all realize how tiny these things are? (see the side by side to the T39). They make even the new Kyocera look like station wagon! The best is the price: just 300 Dollars!!!!! In Europe we get 300 Dollars commision for an 2 year contract from Telecom. So this phone will be porbably for free!!!!! if you have read Samsung i500's spec., you will know that i500 comes with a rechargeable (1100mAh) battery which allows for 200 minute of talk time and 100 hours on standby. Don't forget, i500 has built-in expansion slot, MP3/Video playing and dual color screen! Will the 1100mAH battery enough for running a whole day? tiny is right. they are small, which means the screens are going to be even smaller than the ones on the treo and on the m1xx, on which the palm OS is barely tolerable. To each his own. If a good color & contrast, I think I could get used to it very quickly and considering the overall size of the phone, very happily. I think they look awesome. I have a T39 and consider it the perfect size phone... I would love to have an Onyx. I am not a huge palm user, but I always have my Treo 90 with me just to look up #s, and have my schedule handy.This would fill my needs perfect. The SGH-i500 has an extended battery with a capacity of 1700mah, more than capable of using the phone for a whole day. Great! That's all we need, yet another different screen resolution. Actually, the screen resolution is exactly the same as other low-res Palm devices. Yes, it is showing the Silverscreen launcher. See the "Exit Silver" icon? hmm... if you look carefully at the Zircom vs T39 picture, its running silverscreen too! I think its going to come with the phone, bundled, and not just a simulated picture. Can I get a thumb board??? I'm not nieve enough to think I'm representetive of everyone else out there, but I really need a built in thumb board for this thing.. To me, a smartphone isn't a smartphone without quick email (both push email and ultra quick data entry via a built-in keyboard). The recent deep discounts via rebates from Handspring and Amazon would leave one to believe that a new Treo is coming out soon. Please let it be AT LEAST a OS 5 device with SD expansion. Bluetooth, a more Clie like Jog Dial, internal antenna, and a mic and earpiece on the lid would be nice as well. Handspring, are you listening?? Let's hope. i agree. a thumb board really enhances the utility of a smart phone as a useful email device. but there are others who certainly don't like thumb boards. Agreed, could mean one of two things. The rumors are that a new Treo is coming out this summer however. Doesn't necessarily seem like coincidence, but you never know...they may not make it there. Anyway, I'm still really waiting for a thumboard that will sit vertically in the back of the unit and flip out to go horizontal at the bottom. I'm sure it can be done and it makes the most sense. The Danger Hiptop's screen does something similar (except it basically inverts, going from horizontal to horizontal). It's easier said than done, but if Handspring could produce a thumboard like that with the same specs as the new Samsung OS 5 phone (plus bluetooth and upgradeable to CDMA 3g), they'll have the most technologically advanced gadget on the market. The problem with a thumbboard is, it restricts how small the device can be, especially its width. I don't think you could even subtract 1 cm from the width of the Treo without making the thumbboard harder to use. And width is a very important factor when actually using it as a phone... holding a flat, wide object to your face feels a bit strange. 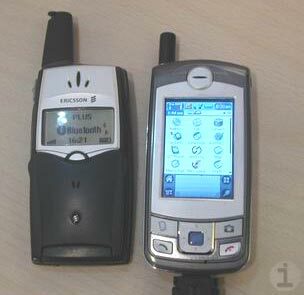 So, given that smartphones with thumbboards aren't going to get much smaller, your best bet is probably the next iteration of the Treo (or the Tungsten W). I hope that by that time the new samsung is out... It will be interesting to compare the two.. I think the Samsung was not going to be available until Fall. Sorry.